The Transylvanian Hound, also known as Pannon Hound, is an ancient Hungarian hunting breed that evolved as a result of specific climate and geographical conditions in the Carpathian Mountains. Its origin dates back to the 10th century. It is preferred for its strenuous hunting skills, its keen sense of smell, and its loyal and brave personality. Archeological discoveries indicate that there were several hound-type dogs during the Migration Period (376–800 CE). The existing hounds mixed with the hounds the Magyars brought with them during the Magyar settlement period (896 CE) into the Carpathian Basin. 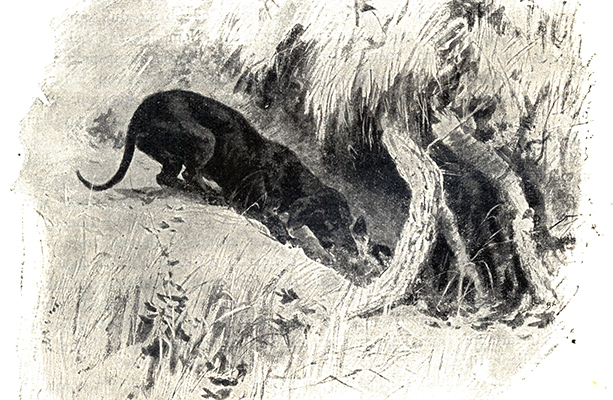 Hunting in deeply forested, mountainous areas of the Carpathians resulted in the Pannonian Hound around the 10th–11th centuries. This is the ancestor of the Transylvanian Hound. Etymologists believe its name came from Persian. Originally, the long-legged version of these hounds was used to hunt larger game such as deer, wild boar, and bison. The short-legged hound chased rabbit, fox and mountain goat. 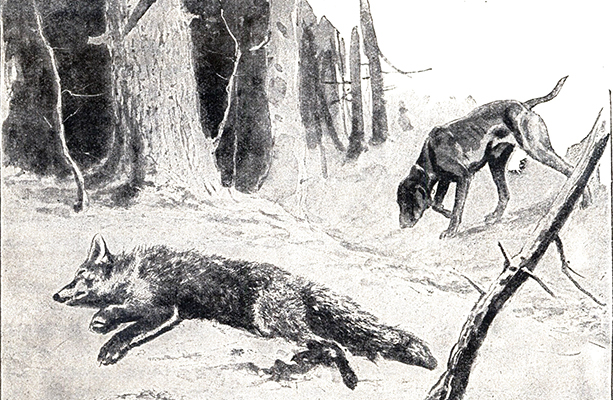 But because of changes to hunting caused by geographical changes, the short-legged version became extinct. 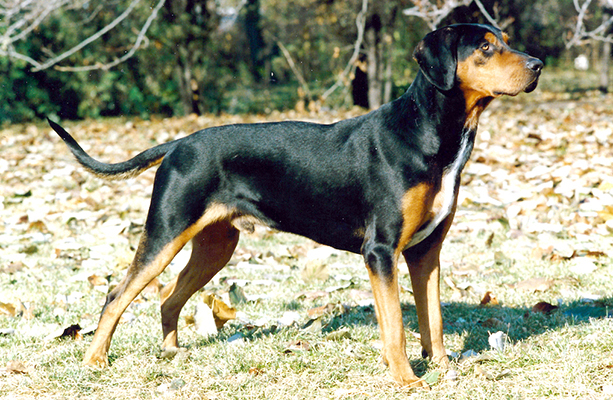 During the mid-20th century, the Transylvanian Hound bordered on extinction due to a 1947 Romanian statute that prohibited gun-ownership. This essentially banned most hunting. It also declared the breed dangerous to the game stock. That caused no litters to be registered between 1947 and 1969. Breed enthusiasts rescued a few and started to professionally breed them, but the continuation of the breed still requires a lot of committment. 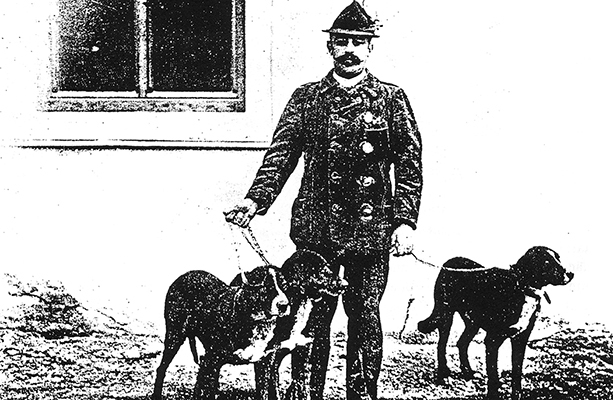 Of the nine Hungarian dog breeds, the Transylvanian Hound remains the closest to extinction. Very few live outside of Hungary. The name of Transylvanian Hound, according to etymologists comes from Persian, and the first written record of these dogs occurs in the 13th century. The name originally meant "catcher." Originally, there were two types of Transylvanian Hounds: short and long-legged version. Both were utilized for hunting specific game. Only the long-legged variant has survived. It is characterized by a medium-sized, athletic, black body with distinctive tan and white patches on its muzzle, chest, extremities, and eyebrows. Its coat is short and dense. Its body is slightly longer than tall, and ideally its height is 22–26 in (55–65 cm). It is slightly rectangular-like with a flat back and straight chest. 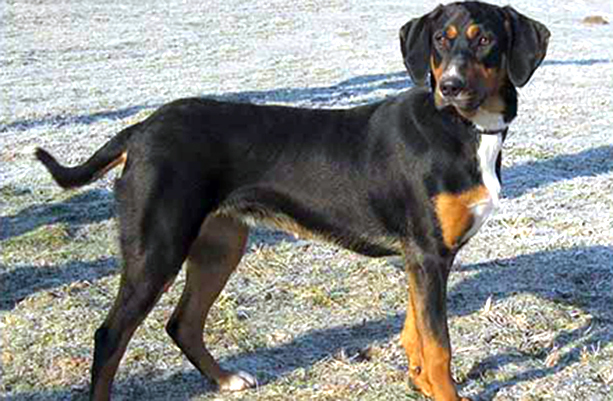 The Transylvanian Hound’s legs are straight and vertical, and their veins are visible. Its feet are large cushioned pads. Its tail is low-set, carried curved and never docked. Contrary to the general custom of docking the tail of a hunting dog, the Transylvanian Hound standard recommends the opposite, to leave it undocked. When a Transylvanian Hound is hunting, its tail is slightly upward. Its head is long, with a muzzle shorter than half the length of the head. Transylvanian Hound’s ideal weight is approximately 65 pounds (35 kg). 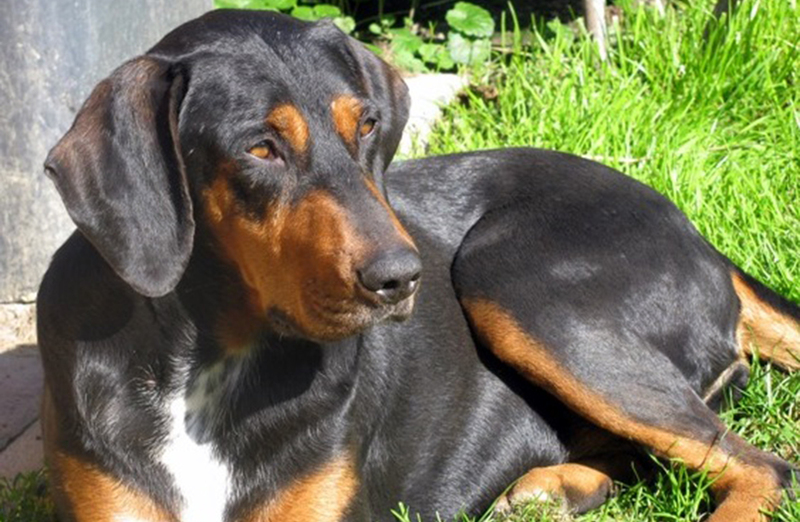 Transylvanian Hounds are good-natured, even-tempered and courageous with a strong-minded hunting instinct. They require a lot of exercise. Transylvanian Hounds prefer to work in pairs with their master and are most effective in an independent working environment. For instance, huntsmen would conceal themselves as the dog-handler would release the hounds in pairs, waiting for them to pick up the prey’s scent. The hounds would then drive the game towards the hunters. The Transylvanian Hound learned to "speak" over the centuries. When they chased smaller game, their bark was high pitched; while chasing larger game, it was deeper, throatier. They can run 40–45 mi (50–60 km) throughout a hunt. Their incredible persistence makes them excellent hunters. Since the Transylvanian Hound is bred to hunt, and not much hunting is possible today, it needs long, strenuous exercise. Instead of a typical walk three times a day, it prefers one exhausting walk each day.